Lausanne, Switzerland, July 8, 2015 - Four teams are fighting for victory in the FIVB Volleyball World League Group 2 Finals and they all have one goal: the final ticket for the Rio de Janeiro Group 1 Finals. In Varna, Bulgaria, the final participant in the FIVB World League Group 1 Finals will be decided on Saturday and Sunday. Hosts Brazil, reigning champions USA, world champions Poland, Italy and Serbia have already secured their spot. The grand finale will take place at the Maracanãzinho Arena in Rio de Janeiro from July 15-19, and will serve as a test event for the volleyball competition at the 2016 Olympic Games at the same venue. The top teams aren't playing in the ninth week of the annual showdown of the best teams in the world and are waiting to see who their final rival will be. France are the clear favourites in the Group 2 Final Four after the results in the preliminary round. The "Equipe Tricolore" ended the preliminary round with an immaculate result of 12 wins in 12 matches. 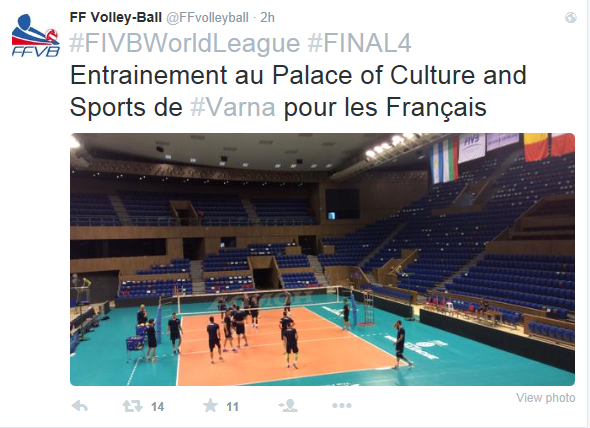 It is an FIVB World League record, but one that means nothing in the Final Four in Bulgaria. Which is why the team is heading to Varna early. Kevin Leroux, Middle Blocker for team France: "It's great to finish this preliminary round with 12 victories, but the hardest work is yet to be done as we are only focused on Rio." France didn't have a particularly good experience in the 2014 Finals: At the FIVB Volleyball World Championships, they finished fourth after some magnificent performances in the tournament and in the finals of the 2014 World League Intercontinental Group 2, they suffered a sensational 3-2 defeat to hosts Australia. For this reason, France wants long overdue promotion to Intercontinental Group 1 this year. It would also be the perfect anniversary gift for the 20th appearance for the team that finished second in the FIVB World League in 2006. In the semifinal, the team that includes stars Earvin Ngapeth and Antonin Rouzier will face Argentina, who secured their final ticket when they beat Bulgaria in their last match. With 17 appearances, the South Americans are one of the veterans of the FIVB World League and are also on the up once again. Naturally the finals will be broadcast live in their home country. Bulgaria, who have already finished fourth five times in the history of the World League, hopes to return to the league of great volleyball nations a year after they were relegated from Intercontinental Group 1. Their great assets include their fans and a team made up of young and old players. Second place in the European Games, as well as the preliminary round wins against top teams such as Argentina and Canada, show just how strong the team's performances are. Coach Plamen Konstantinov is placing his hopes in the will of his team. "We need to do even better than in the preliminary round, playing at the top of our game for two matches in a row. Then we are in with a chance of achieving our great goal." 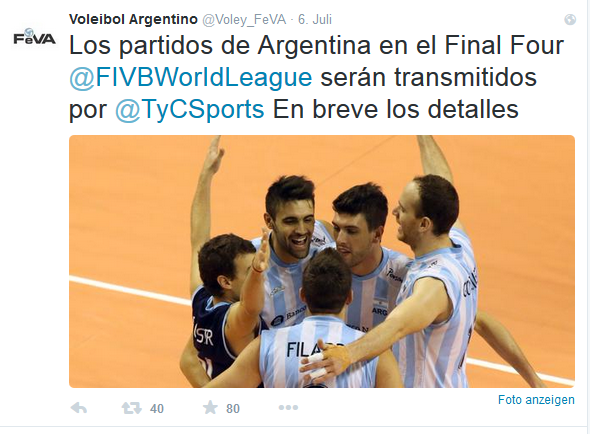 The 26th staging of the FIVB World League has also expanded once again. 32 teams – four more than in 2014 – battle for the title at the most prestigious annual event in the volleyball world, which this year spans a record ten weeks. One winner has already been decided: With victory in Intercontinental Group 3 and the associated promotion, Egypt celebrated the greatest success for African volleyball in the history of the FIVB World League.